cut by 97 per cent, lead time by 98 per cent. Stratasys additive manufacturing compared to CNC tooling- 3D printed injection mold and resulting part next to steel tool of identical designStratasys Ltd. a manufacturer of 3D printers and materials for personal use, prototyping and production confirmed that Robert Seuffer, GmbH & Co. KG (Seuffer), a German supplier of parts for household appliances and commercial vehicles, has incorporated Stratasys 3D printing in its manufacturing process. The investment was made by Seuffer in order to reduce the time and cost of producing injection molded sample parts. The injection molding process is used by manufacturers all over the world to produce parts in a variety of materials, most commonly thermoplastics. Like many manufacturing processes, prototypes have to be produced to evaluate the part design for performance and fit before mass production. Stratasys said the ability to dramatically streamline the tool creation process for producing these prototype parts is another concrete example of how its 3D printing is revolutionizing manufacturing. "Working with the automotive industry, sample parts need to be tested in the environment of moving mechanical parts as well as in high temperature environments," explained Andreas Buchholz, Head of Research and Development at Seuffer. "With Stratasys 3D printing, we can design first drafts of the injection mold within a few days and 3D print them in less than 24 hours for part evaluation. Traditionally, it would take eight weeks to manufacture the tool in metal using the conventional CNC process. And while the conventional tool costs us about 40,000 Euros, the 3D printed tool is less than 1000 Euros, a saving of 97%." 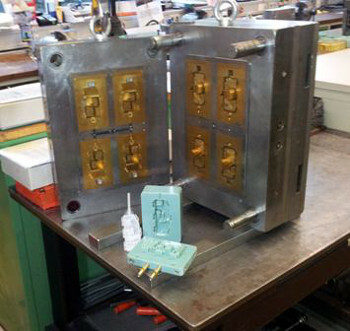 Using Stratasys 3D printing technology, Seuffer also produces 3D printed molds for its hot melt process. 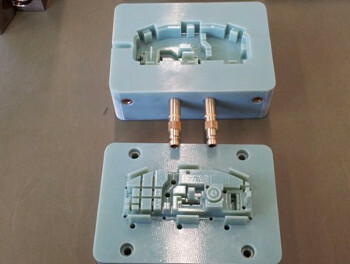 These molds, which are used to overmold low melting point polyamide over electronic circuit boards, are created with Stratasys' rigid, opaque Vero materials. "Companies worldwide are looking to introduce significant efficiencies to their manufacturing processes when introducing new products, and are discovering the many benefits of additive manufacturing, also known as 3D printing," said Andy Middleton, General Manager, Stratasys EMEA at Stratasys. "More and more manufacturers are adopting 3D printed tools as a complimentary injection molding solution - not only to cost-effectively test products before mass production, but also to produce customized parts."